What Did That Building Used To Be? In the comic strip/cartoon "Popeye," Wimpy will always gladly pay you Tuesday for a hamburger today. Many Americans have shared Wimpy’s craving, and over the past eighty years, their appetites led them to new hamburger establishments. An always-on-the-go population wanted their food served fast, and with consistent quality as they traveled. Entrepreneurs of franchises were there to meet their needs, and made sure that their customers identified their favorite restaurant through its logo and the design of its building. McDonald’s and Burger King both entered the Chattanooga area in 1964, with locations on Ringgold Road. The site of McDonald’s is now occupied by Oakwood Mobile Homes. 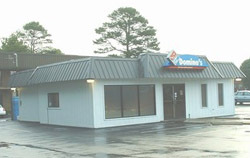 Burger King had a restaurant at 4155 Ringgold Road, which is now a Domino’s Pizza. By 1976, Burger King had closed that location in favor of stores in Northgate and Eastgate Malls. In the early years of hamburger franchising, there were many competitors. Biff-Burger was a chain that stretched from Florida to Texas, with "Biff" standing for "Best in Fast Food." Their menu included char-broiled burgers. In the Chattanooga area, they had a location at 4059 Hixson Pike, at the Access Road intersection. Biff-Burger was later bought out by Burger King. Burger Chef opened a location at 832 McCallie Avenue in 1967. They also featured char-broiled hamburgers, including "The Big Shef." Their restaurant décor included distinctive globe lights in the dining room. The building was sheathed by white porcelain enamel panels with red diamonds. By 1969, this restaurant chain was second to McDonald’s in locations. However, they soon began closing stores as quickly as they had been opening them, and sold out to General Foods and then to Hardee’s. The McCallie location closed in 1972, and is now the office of a detective agency. In the 1970’s, some fresh alternatives to frozen burgers came on the scene. Wendy’s was a pioneer in using fresh hamburger. Some of their competitors didn’t last long. In 1976, Judy’s Hamburgers opened several locations in the area, including one at 4844 Hixson Pike (now the home of Majestic Floors). Wendy’s filed suit, accusing Judy’s Hamburgers of copying their formula. All five Judy’s locations in the area closed in early 1979. Wuv’s, another follower of the fresh idea, opened its wood-grain décor stores in the late 1970’s. They featured fries made with fresh potatoes, which customers could see in bins as they entered. Their motto was "Get fresh at Wuv’s." Wuv’s also didn’t last long. 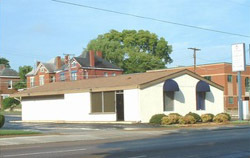 Their building at 4047 Hixson Pike is now Backyard Burgers. D’Lites entered the market with its low-calorie menu in 1985. Their hamburgers were prepared to contain less fat, fewer calories, and more nutrition. In addition to burgers, D’Lites included a salad bar. By 1987, the local D’Lites across from Northgate became a Hardee’s franchise, which it still is today.